America’s Spencer Brittan, 20, and Uncle Blue were first to jump off, and they went for the safe clear, hoping a clean round would keep them close to the top. Peter Lutz was next with Sam, who unfortunately lowered the last jump on course. Canada’s Mario Deslauriers went third, with the youngest horse in the LONGINES Cup, eight-year-old Amsterdam. They would eventually finish in third place with a clean round in a time of 38.53 seconds. Second place finisher and four-time winner of the LONGINES Rider Challenge at the Hampton Classic, Richie Moloney jumped last with Rocksy Music. They too jumped clean but were not able to catch their teammate’s time, finishing ever so slightly off the pace in 36.90 seconds. Saturday’sLONGINES Cup also included a charity component CLEAR THE JUMP FOR JUST WORLD, with Longines partnering with JustWorld International to donate meals to impoverished countries around the world. With Saturday’s initiative, LONGINES presented a check for five thousand meals to JustWorld International. Sweetnam holds onto the lead with 405 points. Moloney sits in second with 294 points and Mexico’s Santiago Lambre is third with 220 points. The Challenge will be awarded Sunday, following the $300,000 Hampton Classic Grand Prix presented by Douglas Elliman. Sunday’s featured hunter competition in the Anne Aspinall ring is the $10,000 Hermès Hunter Classic. It will be followed by the presentation of the Grand Hunter Championship and Leading Hunter, Junior Hunter & Rider and Junior Equitation awards. 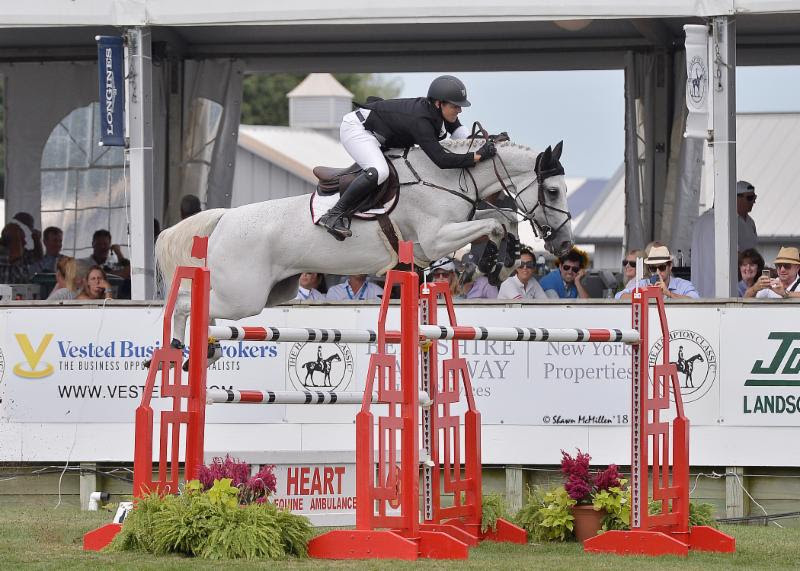 Festivities in the Grand Prix Ring begin with the $25,000 DAWTS Jumping Derby followed by the grand finale –the $300,000 Hampton Classic Grand Prix CSI**** presented by Douglas Ellimanwhich will begin at 1:00pm.